As automotive lenders and retailers, we stand at the edge of deep and transformative change. Skeptical? Don’t be. Consider, instead, the evidence of the coming shift: While dealer-sourced financing makes up about 80% of auto loan originations, car buyers are actively searching for alternative ways to arrange financing before they set foot inside a showroom. According to a recent survey by our company, 86% of customers prefer online financing when shopping for vehicles—before they go to the dealership. It’s not auto retail that’s changing. Auto lending is changing. The fact that it’s happening in an uncertain economic environment, with halting sales and rising interest rates, only serves to create hypertensive moments for buyer and seller alike. It doesn’t change the reality of what’s coming. 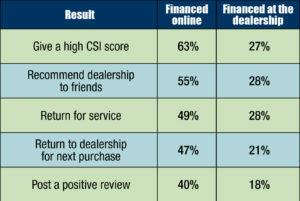 Indeed, for dealers and lenders who are adjusting by applying new innovative technology solutions, the payoff is—according to our survey—a potential 115% increase in the perception of dealership favorability, as measured by their likelihood to return to the dealership for additional service, give a five-star rating, and recommend the dealership to friends. The accompanying table reveals some more stats from our recent survey. The takeaway is clear: Happy customers make happy dealers–and the best way to turn frowns around is to offer online financing earlier in the process. You can do that through technology. The driving force is technology, but with an important caveat: We’re talking about technology that works within a framework of mobility, and with a supporting emphasis on customer service. The point is that online financing doesn’t replace good customer service, it just makes life easier and more convenient for car buyers. It creates efficiencies, which improves productivity. That’s a very good thing in a world of margin compression and corresponding cost cuts. And it works in real life, where it counts the most, with obstacles and challenges like bad credit, inventory availability, interest rates, and more. 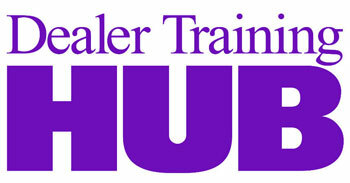 A good example occurred recently at Paul Miller BMW in Wayne, New Jersey. The dealership had a customer who was unable to obtain financing the traditional route, but by using a vendor partner’s online financing solution that blended technology and customer service, a deal was arranged to circumvent the typical paperwork game. Instead of making the customer and salesperson build a package of forms—only to receive a “sight” check and make the customer wait several days for a check to clear—the transaction included a printable paper check for the dealership to immediately deposit. This type of technology-infused service that integrates into existing workflows helps produce the experience customers are looking for, with the efficiency of being able to cut through the red tape of the typical transaction. 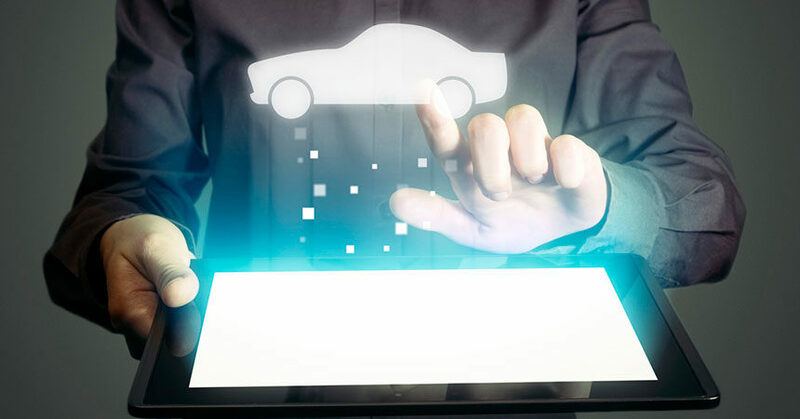 Car sales can take hours, but in this case, the dealership was able to save a significant amount of time because the customer did virtually all the work online before coming to the dealership. Paul Miller BMW applied an open and flexible approach to financing that got results. In the future, more auto financing can be handled in much the same way because it’s fast, easy, and efficient. The important thing is to keep in mind that the latest finance technology is a tool to make life better for all parties involved in a transaction. Enhances customer service. While online and mobile financing platforms are amazing in their ability to complete a complex loan transaction in mere moments, there’s often a need to discuss changes and details. Good technology enhances this by handling mundane tasks, and letting your staff serve customers the right way. Keeps it simple. A technology solution that handles too many complicated functions is one that collects dust, and becomes unused and forgotten. Reduces expenses or saves time. Finance solutions should, at the very core, remove expensive bottlenecks in the process, and free up productive time. A dollar saved is better than a dollar earned. When it comes to technology, the first and foremost priority is to reduce time. Change is always good—it’s getting through it that can be difficult. Yet adapting to new ways of providing financing to customers is a vital step to take in a world that’s moving fast toward a customer-centric point of view. Ultimately, dealers and lenders want customers to do business with them more than once, and if they’re happy, they will. Jim Landy is CEO and founder of SpringboardAuto, a digital retail company that is revolutionizing the automotive fintech space. SpringboardAuto’s mobile-friendly auto finance solution simplifies a secure online transaction for customers, dealerships, and private sellers. As an automotive finance innovator and veteran, Landy has founded and served as CEO of multiple companies including CarFinance Capital; RoadLoans.com, one of the first online auto finance brands; and Triad Financial Corporation, which later became part of Ford Motor Credit.